The high school basketball season saved its best stunner for last. 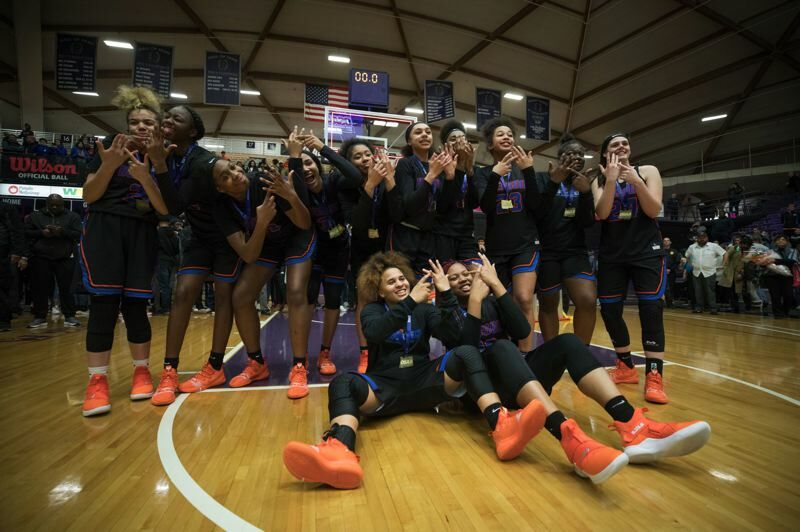 In the final game, Benson's girls knocked off two-time defending state champion Southridge 66-42 to win the Class 6A title at Chiles Center. One year earlier, Southridge beat Benson in the same round, on the same court, 46-27. This time, it was all Techsters. They got off to a blistering start, led throughout and had the victory in hand by early in the third quarter. Benson guard Bria Dixson and her teammates looked up at the scoreboard during the game and marveled at what they were accomplishing. "I just kept thinking, wow, how the tables have turned," Dixson said. Benson's breakthrough was the result of years of work by the players and coach Eric Knox. "We dreamed of this, of this moment," Knox said. Afterward, the Techsters were able to cut down the net and celebrate their first girls basketball title with a large and loud contingent of fans from Benson and elsewhere in the Portland Interscholastic League. "I felt them," said all-tournament senior guard Ciera Ellington. "They carried us." Earlier Saturday, the Jesuit boys showed similar emotion, both during and after their 6A final, as they fought off the PIL's talented Jefferson Democrats 71-66 to claim a seventh state title for coach Gene Potter. While the Crusaders' triumph was in some ways a win for the so-called little guys — Jesuit didn't have Jefferson's size up front — it was nowhere near the shocker that would take place later in the girls final. 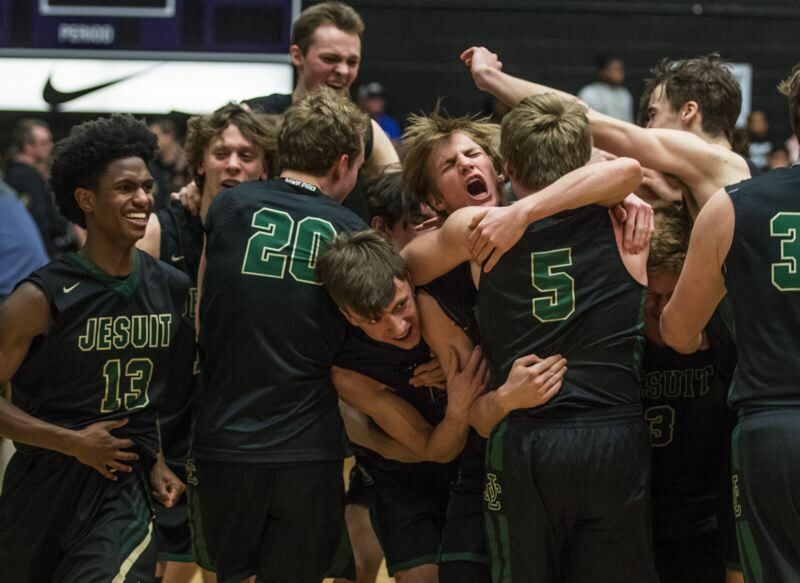 Anyone who saw Jesuit dismantle its first two opponents in the state tournament, could see a team that was peaking at the right time, guys with swagger, defensive tenacity and shooting touch. Jesuit led all tourney teams by a wide margin in 3-point and free-throw percentage (.429, .807), and in defense, allowing 48.0 points and .217 3-point shooting. "You're not going to shy away from anybody here and win," Potter said. So the Crusaders tore apart Central Catholic 64-38 in the quarterfinals, then ripped No. 1-ranked Lake Oswego 39-18 in the second half of the semifinals for a 52-40 victory. Jesuit may have come into the championship game one notch lower than Jefferson in the seeding (Jesuit was ranked fourth), but the Crusaders knew they could win. They'd led Jesuit by double digits — at Jefferson — in the season opener before falling 79-75 on Nov. 30. The Crusaders had four senior starters to Jeff's three, one of whom, star guard Marcus Tsohonis, was laboring with an ankle injury. But the difference in the title game was Jesuit, its drive, its will to win, its execution and its sharp shooting from distance. Senior guard Aiden Williams hit five 3's to score 20 points and help 6-5 senior Justin Bieker (22 points) lead the way offensively. Potter said his team played an "A-plus game ... and this time, we finished the deal."